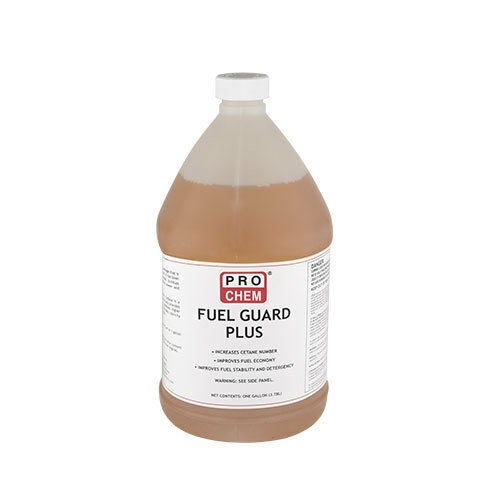 FUEL GUARD PLUS | Pro Chem, Inc.
FUEL GUARD PLUS is specially formulated to enhance cetane in both high and low sulfur diesel fuels. This unique formula offers better detergency for easier starts, faster warm-ups and less engine noise due to your engine’s increased efficiency and power. FUEL GUARD PLUS also gives increased lubricity protection against sludge formation and reduces the engine’s exhaust and emissions while protecting against color degradation and sludge formation. Add 1 pint to 25 gallons of diesel fuel or 1 gallon to 200 gallons of diesel fuel. Note: This diesel additive complies with the Federal low sulfur content requirements for use in diesel motor vehicles and non-road engines.